Do you need a pallet racking system that provides deep-lane, high-density storage, with expert, single SKU per lane selectivity, and first-in/first-out stock rotation? Could you use pallet racking that utilizes flow rails with wheels, set at a decline, for easy transfer of pallet loads from in-feed to out-feed positions? When first-in/first-out stock rotation and high-density storage is important, you need a Gravity Flow Pallet Racking system from Naumann/Hobbs. Pallet racking systems are versatile but must be properly engineered. The design engineers at Naumann/Hobbs are experts at understanding and developing all the different design variables to provide a successful and safe gravity flow pallet rack system for your warehouse. Because every warehouse is different, we offer a variety of new and used pallet racking systems, including very deep systems that can hold up to 20 pallets deep. We also provide system components like wheels, rails, brakes, and more to customize your design. The experts at Naumann/Hobbs is here to help you design the optimal system with the best components to meet your needs. We have just the gravity flow pallet racking system for your warehouse. 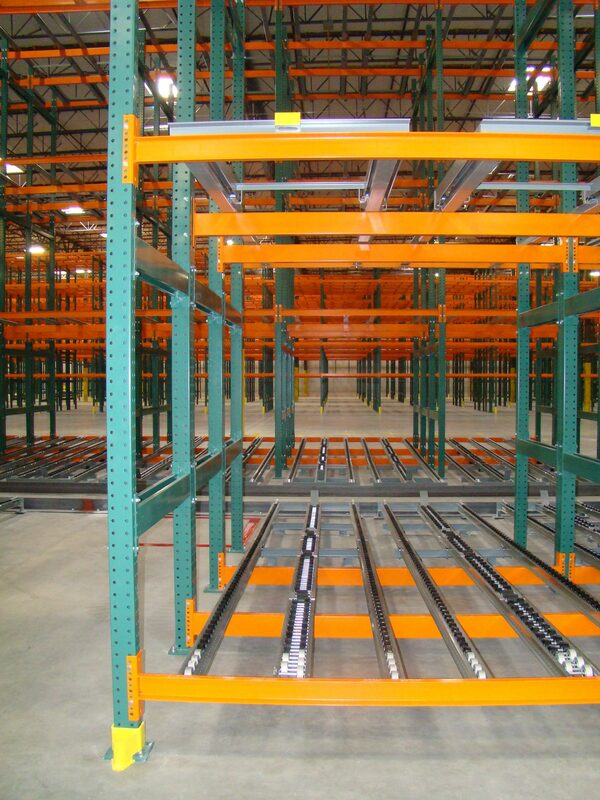 Call (866) 266-2244 and our racking specialists will come to your warehouse and start designing your new system today.